Secrets She Left Behind is the sequel to Before the Storm. One afternoon, single mother Sara Weston says that she’s going to the store—and never returns. In her absence, she leaves her teenaged son alone with his damaged past and a legacy of secrets. Keith Weston nearly lost his life in an act of arson. He survived—but with devastating physical and emotional scars. Without his mother, he has no one to help him heal, no money, nothing to live for but the medications that numb his pain. Isolated and angry, his hatred has one tight focus: his half-sister, Maggie Lockwood. Now the person Keith despises most is the closest thing he has to family—until Sara returns. If Sara returns. . .
"(Chamberlain) explores the psychological complexity of a family pushed to its limits...the alternating narratives allow plenty of insights into the characters' motives while creating intrigue and suspense." 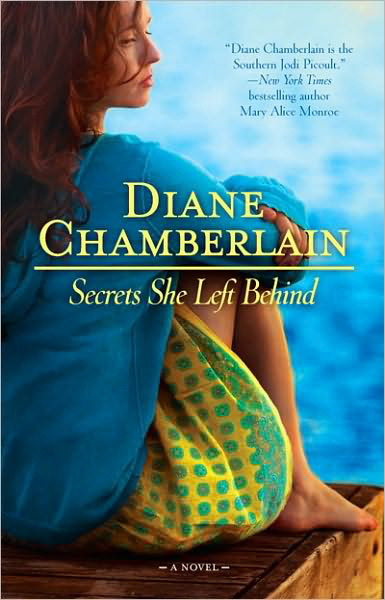 "In Secrets She Left Behind, Diane Chamberlain tells the story of a son's abandonment and pain in many voices, changing characters with each chapter. You won't be able to put this one down until the final layers of the story are in place and the complete picture is revealed." "Diane Chamberlain is superb at creating characters we become involved with, spinning out the story of the havoc caused by a teenager’s mistake and weaving in the past to make this a novel hard to put down." (Spoiler alert! If you haven't yet read Before the Storm, this excerpt will give away some secrets). I sat on Miss Sara’s couch and killed all the Mega Warriors. I could usually kill them better, but her TV was way littler than ours and I was sick. That’s why I was in Miss Sara’s trailer. Only I wasn’t supposed to call it a trailer. “It’s a mobile home,” Mom reminded me when she brought me here this morning. Even though she sometimes called it a trailer, too. Things were different since the fire. Mom said I should call Sara “Miss Sara” like I did when I was little. It’s politer. Miss Sara used to hug me and be real nice and Mom’s best friend. Since the fire, Mom and her hardly even talk. The only reason I was in the mobile home was because Mom was desperate. That’s what she said to Uncle Marcus this morning. “I can stay alone,” I called, but it came out quiet on account of being sick. I was sixteen; I didn’t need a baby sitter. I was sure I was done barfing, too. I couldn’t be sick any more because Maggie was coming home today. I wanted to jump up and down and yell “Maggie’s coming home!” but I was too tired. I could only jump up and down in my imagination. I heard Mom on the phone with Miss Sara. “Please, Sara. I’m sure it’s just a twenty-four hour bug. I know it’s a huge favor to ask, but I can’t leave him alone. It’ll only be for a few hours.” In the before-the-fire days, Mom would say “Can you watch Andy today?” and Miss Sara would say “Sure! No problem!” But this wasn’t those days anymore. I pulled the blanket over my head. I didn’t want to get up and get dressed and go to Miss Sara’s trailer! I just wanted to go back to sleep 'til Maggie got home. “Mm,” I said. That meant yes, but I was too tired to open my mouth. I knew she wanted to reach back and touch my forehead. She was a nurse and she could tell if you had a fever by touching your forehead. Nurses are very smart like that. Free, I thought. Maggie would finally be free. I hated visiting her at that stupid prison. At the trailer, I laid down on Miss Sara’s couch with my pillow. Miss Sara got a blanket and Mom covered me over. She got to put her hand on my forehead then. She gave Miss Sara ginger ale and crackers for me. I started falling asleep as Mom said “I can’t thank you enough, Sara,” and things like that. Then she left and I fell asleep for a long time. I woke up and Miss Sara was walking across the living room. She looked right at me. She was carrying a big box with a picture of a pot on it. She stopped walking and put it on the floor. “How are you feeling?” she asked. She had some lines on her forehead and by her eyes. So did Mom, but not as many. “‘Kay.” I said. My mouth tasted icky. I nodded. Except for feeling tired and kind of shaky, I was fine. I could of stayed home alone, no problem. I sat up and Miss Sara brought me ginger ale in a glass with ice and crackers on a plate. Her eyes looked like she’d been crying. They were red how your eyes got. She smiled a funny smile at me. I smiled one back at her. People sometimes cried when they were happy and I knew that’s what was going on. Mom had red eyes all week. Miss Sara was probably as happy about Maggie coming home as we all were. I drank some ginger ale which tasted good. Miss Sara carried the box outside. When she came back in, she said “Do you want to play some of Keith’s video games?” which is how I started playing Mega Warrior. Now I shot another Mega Warrior and then a Super Mega Warrior, which are the ones with the arrow things on their heads. At least it was a school day and Keith wasn’t home. Keith was one of the people I couldn’t save at the fire. Mom said he could actually die at first, but he didn’t. He got scars, though. His hands and his arms look like they have maps on them, only without the country names. One of his hands is scrunched up, kind of. Part of his face has that map look on it, too. He got held back and now we’re both juniors. He hated me even before I couldn’t save him. I felt sorry for him, though, because of his scars. The phone rang in the kitchen. I could see Miss Sara pick it up. She made a face. “You said no later than two, Laurel!” she said. Laurel was my Mom. One of the regular warriors killed my littlest man. That happened when you forgot to concentrate, like I was doing because I wanted to know what Mom was saying. “All right,” Miss Sara said. She hung up the phone without saying good bye, which was rude. I wasn’t doing so good at Mega Warriors now, but I had good determination and kept trying. Miss Sara came in the room again. “Your Mom said she won’t be back till around four-thirty,” she said. “Okay.” I killed two Super Mega Warriors in a row. Bang! Bang! Then one killed me. I looked at her face even though I didn’t stop pushing the controller buttons. She put one of those long white envelopes on the coffee table. It said “Keith” on it. She was in my way. I had to move my head to see the T.V. I stopped pushing the buttons. She was using an I-mean-business voice. Mom won’t be here until . . . later.” I couldn’t remember the time she said. “And what else?” Miss Sara used to be so nice. She turned into another lady this year. “Give the mail to Keith,” I said. “Good bye.” I wished she would just go. I started playing again when she left. Then I got thirsty and my glass was empty. I walked in the kitchen to get more ginger ale. I saw the mail that said “Keith” on it on the table. She said it was important. What if Keith didn’t see it there? I took the envelope back in the living room and stuck it in my bookbag so I couldn’t forget to give it to him. Then I sat down again to kill some more warriors.